These dwarf alberta spruces were at my Walmart for $5~planted in a yard sale terra cotta pot ($1) and added a pony pack of purple lobelia. If you want another idea for the plastic hanging flower baskets, you can see what Kimba did with hers here. I love Vinca. It's so easy and grows so quickly. Miracle Gro Liqui-Feed helps immensely! Your flag is the cherry on top. We have one as well, but on a pole in the yard. It makes me so proud to see it waving against the blue sky! Our vincas go crazy every year! Your flowers look great! I got an unbelievable deal on flowers at Lowes the other day. They were getting in new shipments and had to clear out some of the old stock. They were selling a bunch of the little pony packs for 10 cents each! There were 6 ponies in a flat and I bought 13 flats for less than $10! Lobelia for my baskets, dianthus and verbena. Woohoo! I sure hope you can keep that fern alive too! Like all you've done! 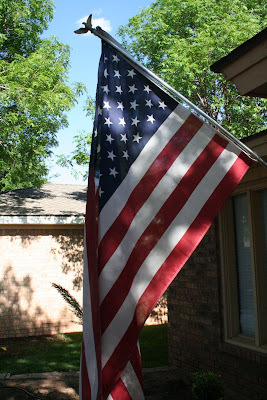 I remembered to put my flag out on Armed Forces Day! I'll just leave it out now for most of the summer as the area is lighted all of the time...just bring it in when it rains. Hey lady...I haven't been around in a while! Love your painted projects below! Looks great, Melissa. Your patio looks so summery and inviting. I'm hoping I can get a few more things planted before you guys come - we'll see how things go. :) Love ya! You got some great deals!!!! The past two years we have been buying directly from a grower on the side of the road and our flowers last year were planted in April and THRIVED thru November. That is amazing for Texas! Hopefully we will have the same luck this year. I love it all! 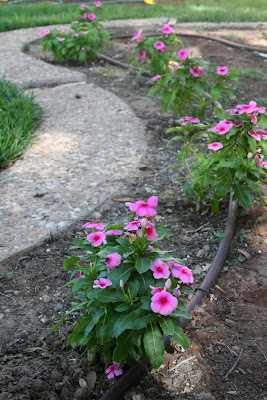 My vinca vines go nuts and with little maintenance, and that is just my type of thing. 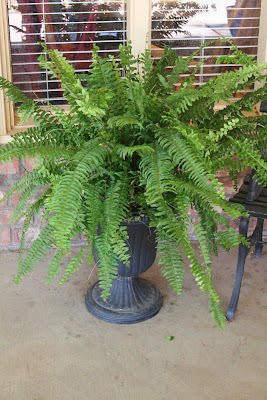 I also got a couple of those Wal-mart ferns. They were a great buy! 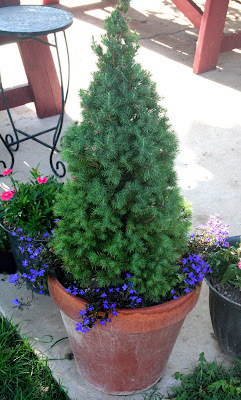 I am in love with the little spruce tree in the pot. I'm going to do that. 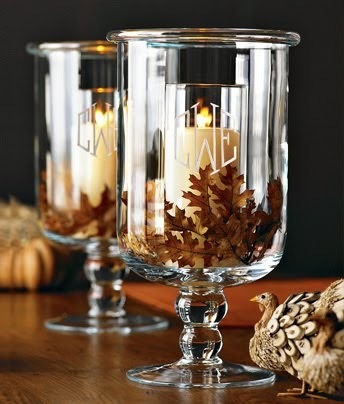 Hi Melissa~ I can't remember where I found your blog, but i enjoy looking at your redos! I, too, live in a state of constant-remodeling! Looks fantastic! I love the vinca and may have to invest in some this year. Our walmart was selling the ferns for $13! Darn! I flew my flag on Armed Forces day and basically whenever I feel like it. What great idea's. Love the tree with the lobelia, love the look. Your plants & flowers look great. Hopefully they will stay that way. I'll have to check out my local Wal Mart to see if they have any deals. We usually get our flowers at Home Depot as they guarantee them for a year. Even if you forget to water them. Just have to remember to save the receipts. Hi! 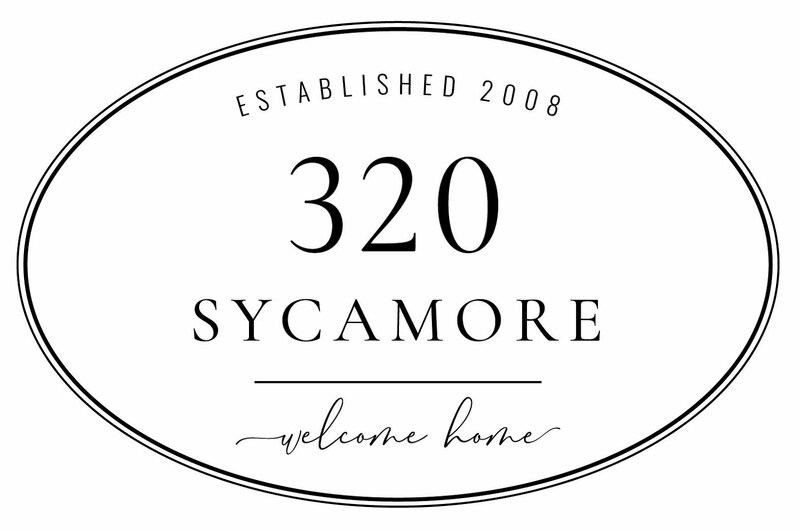 I love your blog and just wanted to letyou know that you have inspired me to start my blog for the journey of remodeling my home! I would love your opinions so feel free to follow my blog :) Thanks so much for your ideas and inspirations. Keep them coming! Amen sistah! I just spray painted my flag pole and got that back up. I can't believe those little trees were $5!! !